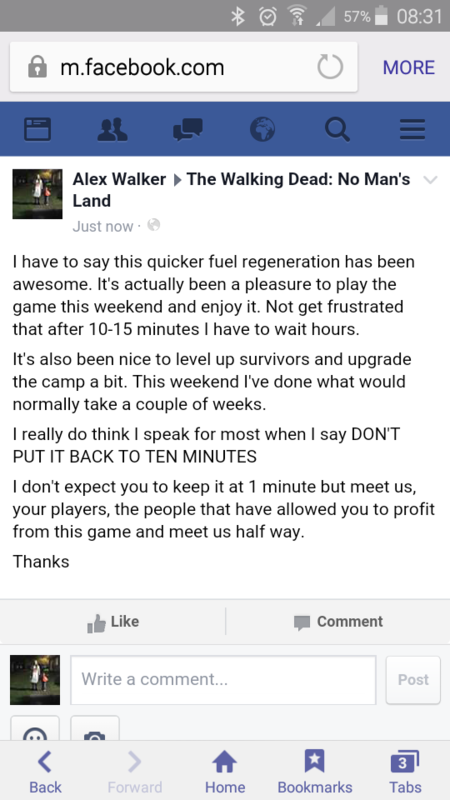 Dear TWD game. I have attached a screen shot of what I put on facebook. Please respond. Maybe a exploring mission that pays out in gas like the food or exp missions would be nice if they won't bump the time up. Games need to slow play down so people pay. I get that, but agree that maybe there need to be other things to do. Maybe there are no gas missions, but they have limited rewards. Maybe only 1 case at the end. Screen shot failed in previous post so here it is. Yeah agreed I want to play the game when I want not have to wait. Surely the main thing a game maker wants is people to play the game. Putting a barrier in the way that limits you to play for a miniscule amount of time makes me sad. I made hundreds of threads about fuel time.. 10 min is really bad idea. Maybe if nobody will refill by gold then they will reduce it. ...or just leave gas for challenges!! 90% players for 5 days doing only challenge. Why to not let to play exploration freely? A building addition, like a "still," that reduces the gas time would be cool. Just mix in more ethanol to the gas supply. Just don't drink any. Ha ha. now that i think about it, i would say NO.. do not change the fuel refill time. Its ok the way it is.. I also agree. During the reduced gas time, I actually found myself spending more gold on upgrades and going for extra tickets than normal. Although I rarely came across any rewarded weapons I needed, being able to take chunks out of upgrading high level buildings and survivors was a plus and I didn't mind spending the gold. Considering the time it takes to collect all the materials for upgrades, I believe upgrade costs are a little too high, and the return on retired high level upgraded survivors or scrapped weapons should be much higher - but it is what it is and I'll save that conversation for a different thread. Bottom line, I see it the accelerated gas as a win / win for both sides. Players get more personalized gameplay and devs pick up a couple extra bucks here and there. i am agree with @aysatyo , it is fine as it is. but i would like to see increased of gas capacity. it takes 3 hour to refill, if we are working or sleeping for 6-8 hours, thats going to be waste.